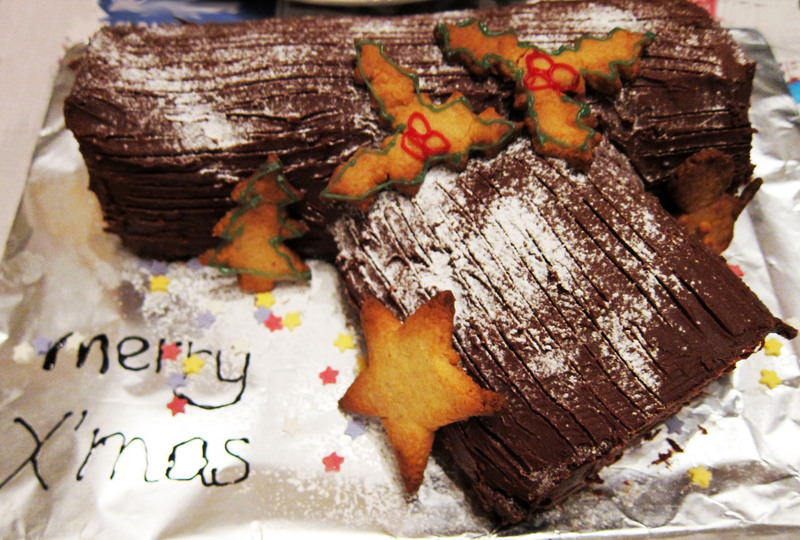 I am keeping the tradition of making a log cake again this christmas! I couldn’t find chestnut puree, so I decided to fill a chocolate log cake with hazel pastry cream instead. Hazelnut goes really well with chocolate. 1. Preheat the oven to 180C. Grease a 30x20cm swiss roll tin and line the base with greaseproof paper. 2. Put the egg yolks in a food mixer and whisk for a couple of minutes. Sprinkle over the soft brown sugar, breaking up any lumps, and whisk until you have a thick mixture. Meanwhile, sift together the cooca powder and seasoning, then whisk them into the egg yolk mixture. 3. In a clean bowl, whip up the egg whites to soft peaks, then fold them into the rest of the mixture. Pour this into the tin, spread out evenly, and bake for about 30 minutes until cooked and bouncy. Put a clean tea towel on a cooling rack and top with a similarly sized piece of greaseproof paper. 4. When the roll is cooked, run a knife around the edges, then shake it out on to the greaseproof paper. Peel off the lining paper, and then, using the tea towel to help, roll it up tightly and leave to cool on the rack. 6. To make ganache, microwave cream until small bubbles appear, then whisk in chocolate until smooth. Cool before icing cake. 7. When the roll is barely warm, unroll it on a board, remove the paper, and spread with the hazelnut cream. Roll up again, and place on the serving plate. Spread with the ganache. Dust with icing sugar for a snowy effect just before serving. Use regular cocoa instead of dark cocoa in the future. The latter was way too bitter. I had too much sugar in my pastry cream so adding hazelnut praline (as in Olga’s recipe) was going to make it too sweet. I will try adding less sugar to the pastry cream and adding hazelnut praline instead of hazelnut next time.